Adam Cahn, aka "Heavy Metal David Ash" (Photo: James Schleicher). Nicknames: Cahn, Heavy Metal David Ash (He believes Kieth Moreland gave him the name. The name was actually given to him by Lowell Galindo of Longhorn Network). From: New York City, New York. “I’ve lived on Riverside [Austin] for about the last three years, but technically I’m from New York City." 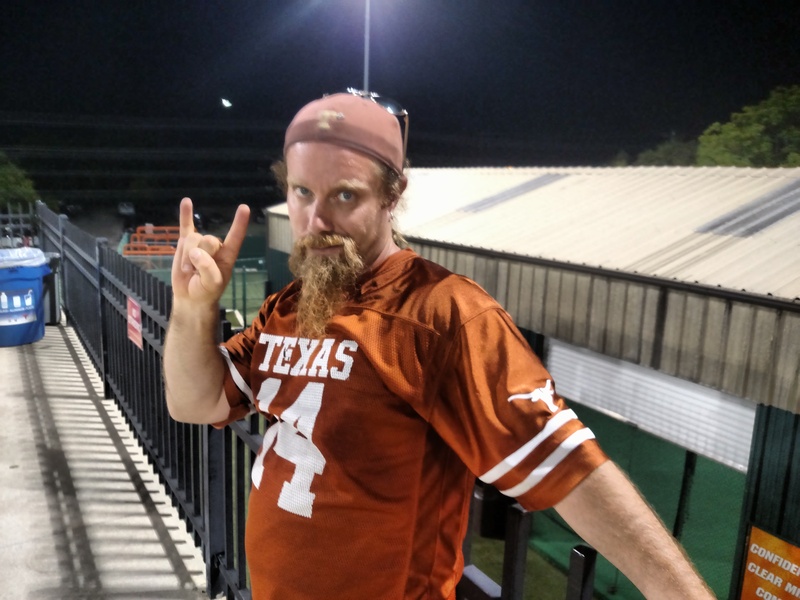 Uniform/Outfit: Burnt Orange Longhorn Football Jersey with the number 14 on the front and back, khaki cargo shorts, flip-flops, fitted baseball cap, sunglasses. Who is your favorite Longhorn of all time? : Roger Clemens. I’m a Yankees fan. 2nd is Colt McCoy. How many games did you come to this season? : A bunch. I’d guess about 20, but that’s a guess. What’s your favorite Longhorns Baseball memory? : Meeting Kody Clemens two weeks ago outside the left field fence. What is your favorite play of the season? : Kody Clemens hitting the home run against TCU on Friday night. What do you think of The Disch? : I think we need a lot more Kody Clemens.